Shiah Sanders goes up for a kill. 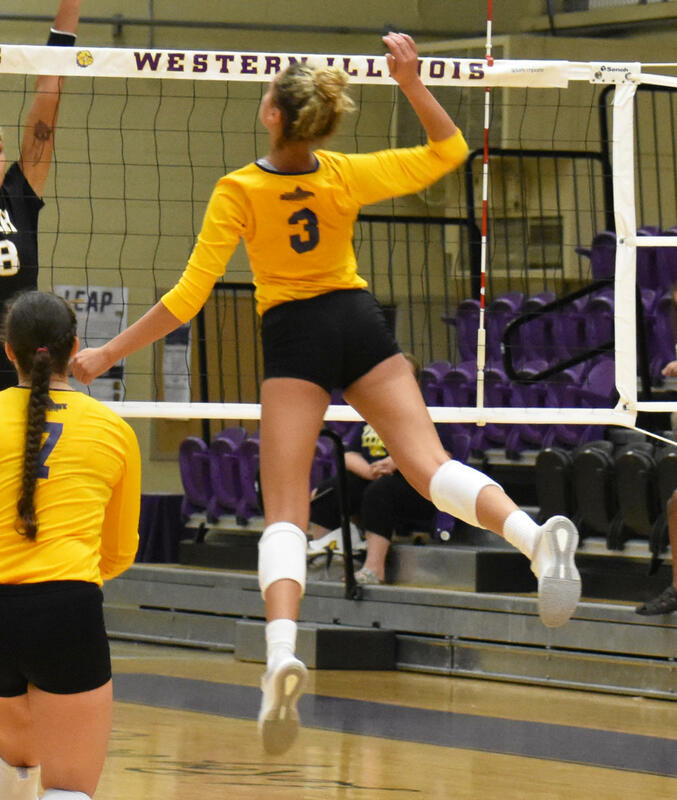 The Western Illinois volleyball team travels to Florida this weekend to participate in the Florida Gulf Coast Tournament. The Leathernecks come into the weekend looking to improve from their 1-5 record. However, two of the five loses have come in a heartbreaking fashion, with a loss in the fifth set. Seniors Melaine Patenaude and Shiah Sanders lead the Leathernecks. Patenaude leads the team with 79.5 points (averaging 3.31 set) and 66 kills, while Sanders is fourth in points with 48.5 and third in kills with 38. Sophomore Emma Norris has gotten off to a hot start with 59.5 points and 50 kills making her second on the team in both categories right behind Patenaude. They will open up against the University of Albany Great Danes on Friday at 11 a.m. in the first game of the tournament. The Great Danes come into the weekend with an identical 1-5 record same as the Leathernecks. After that they will play their second and final game of the day scheduled at 3 p.m. against The Mountaineers of West Virginia University. The Mountaineers have also struggled so far with a 2-4 record, losing four straight. However, they haven’t had the easiest schedule, with two of there four loses coming against top ten opponents: No. 9 BYU and No. 1 Stanford. Freshman Kristen Lux has been a spark plug early in the season for the Mountaineers, leading them with 51 kills and 62.5 points. Juniors, Katelyn Evans and Natania Levak are respectively second and third on the team in points and kills. These three players will try to overpower the Leathernecks for their third victory of the year. The final game will start on Saturday at 10:30 a.m., Western will go up against the Eagles of Florida Gulf Coast University. The Eagles not only have home court advantage, but they also have sophomore super star Courtney VanLiew. VanLiew leads her team with 87 points and 83 kills. She along with senior Amanda Carroll (46.5 points and 41 kills) and junior Danielle Serrano (48 points and 32 kills) are the top three players of their team. Together this trio has helped the Eagles go 4-2 coming into the tournament. No doubt the Leathernecks will have their hands full in this matchup. The Leathernecks come into this tournament with their backs against the wall losing five in a row. It won’t be easy, but winning these three games against high quality teams will get their season back on track.